American multiplexes are no longer the be-all and end-all for Hollywood. It had all the makings of a summer blockbuster, from its “Lord of the Rings”-style mythology to its bevy of computer-generated action scenes. But when “Warcraft,” a big-budget movie adaptation of the orcs-versus-humans video game series, hit American theaters in June 2016, it landed with a thud, scraping together about a quarter of its $160 million price tag. On the other side of the world, however, “Warcraft” rode a wave of hype to a record-breaking opening and a total gross of more than $200 million. In China, home to 1.3 billion people and the second-largest box office on the planet behind the United States, the jam-packed premiere was “like a festival,” one fan told a local newspaper. The commercial fortunes of “Warcraft” — DOA in the U.S., megahit in China — were unusually lopsided, but they were also a revealing example of the forces that have continued to reshape Hollywood, driving studio executives to rethink old business models. American multiplexes are no longer the be-all and end-all for Hollywood. The major studios, some in partnership with Chinese financiers and co-producers, are finding that there’s sometimes more money to be made in Shanghai and Beijing, where middle-class consumers thrill to big-budget spectacles. Attendance at American movie theaters has slumped in recent years amid rising ticket prices, fatigue with long-running franchises and stiff competition from streaming services. But in China, where tickets are generally cheaper and Netflix is banned, hundreds of millions of people flock to the country’s more than 40,000 movie screens every weekend. The last two installments in the “Transformers” and “Fast and Furious” sagas, for example, exceeded their domestic grosses by tens of millions in China. (“Furious,” like “Warcraft,” is a product of NBC News’ parent company, NBCUniversal.) And this spring, a string of new offerings at your local theater — from the "Tomb Raider" reboot to "Ready Player One" — were bigger in China. “This is a monumental change for an industry that once focused almost exclusively on North America,” said Paul Dergarabedian, a senior analyst at the media measurement company comScore. The state of affairs that helps explain the uneven earnings of, say, the giant robots sequel “Pacific Rim: Uprising” ($58.6 million in the U.S., $100.4 million in China) has been building for at least six years. In 2012, China eased up on historical fears of Western imperialism — Rocky and Rambo could be agents of American propaganda, after all — and loosened its quota for international movie imports, agreeing to admit about 34 a year. Chinese box office revenues for American-made movies have since grown every year. Chinese moviegoers who spoke to NBC News last week said they adored the world-class production values of American genre fare — especially superhero projects like the new Marvel extravaganza, “Avengers: Infinity War.” The movie, which racked up $250 million at the U.S. box office over the weekend, is set to open in China on May 11. “Hollywood movies are sophisticated, streamlined productions … so I think they are worth spending money on,” said Wang Hui, 25, an English teacher in Beijing, who added that most big-city moviegoers she knew were young and superhero-mad. And yet even as China has opened its doors to Marvel, Pixar and Despicable Me, the arrangement hasn’t been without its asterisks for American producers and distributors. This is a monumental change for an industry that once focused almost exclusively on North America. China still puts careful limits on the number of American movies allowed into the marketplace, and regulators occasionally impose “blackouts” on American fare so local products get a chance to shine. U.S.-based studios only get about 25 percent of ticket sales from Chinese box offices — roughly half of what they get stateside. But the relationship between the two superpowers, at least when it comes to making movies, has become increasingly collaborative, according to analysts. Chinese financial backers and producers, like the state-run China Film Group, have a hand in various Hollywood projects. American studios have also tailored some of their output with Chinese tastes — and Chinese censors — firmly in mind, occasionally casting Chinese actors in supporting roles, filming key scenes in the country, or modifying storylines that might cause offense. U.S. audiences might want to bear that in mind when they see trailers for “Skyscraper,” an upcoming action film, starring Dwayne “The Rock” Johnson, set at a Hong Kong skyscraper that comes under attack by terrorists. 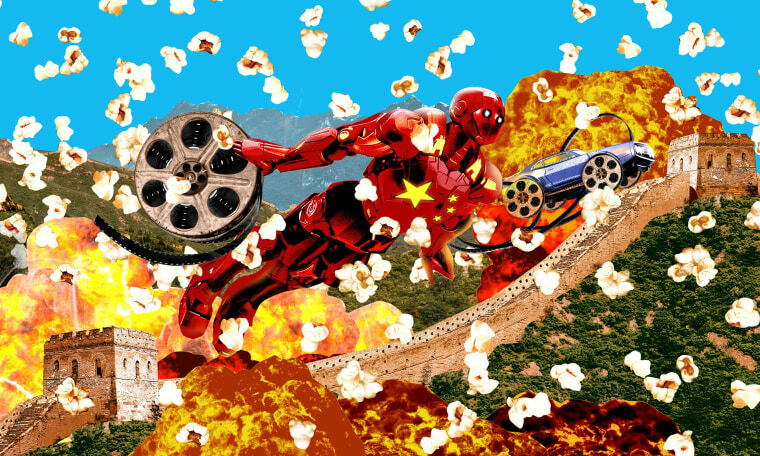 Many industry observers have questioned whether Hollywood should just skip over domestic releases and take their products straight to China, where the general appetite for effects-heavy epics tied to well-known brands, like Marvel, shows no sign of waning. That kind of business model could be in the cards, but the risk might come with dwindling rewards. Hollywood may not dominate the Chinese market indefinitely. China’s theatrical box office revenue overtook North America’s in the first quarter of 2018, according to data assembled by the trade publication Variety. And many industry analysts, with an eye on market trends, have predicted that China’s box office will be the largest in the world by 2020. But so far this year, Chinese growth has largely not been driven by American hits like “Black Panther.” The real growth-drivers are a trio of Chinese-made hits that Hollywood had virtually nothing to do with: “Operation Red Sea” ($579 million), “Detective Chinatown 2” ($541 million), and “Monster Hunt 2” ($356 million). Those three movies were the product of what has become, under the nationalist government of Chinese President Xi Jinping, an increasingly assertive and profitable homegrown film industry, according to Richard Gelfond, the chief executive of IMAX. “The government has really encouraged more local production and China has become increasingly less reliant on importation,” Gelfond said. Already, analysts say, there are signs Chinese movies could eclipse Hollywood’s fare. “The goal is to supersede Hollywood,” said Fritz, who is also a reporter at The Wall Street Journal. And if that happens, film historians of the future might look back on 2017’s “Wolf Warrior 2” as the game-changer. Dawn Liu and Eric Baculinao contributed.